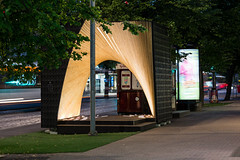 The Pauhu pavilion was completely designed with Rhino and Grasshopper and VisualARQ was used for the fast creation of the construction drawings. “Pauhu pavilion was realized as a voluntary project as a part of Tampere Architecture Week, in Finland, bringing together architecture and design students and professionals in addition to a number of different sponsors. 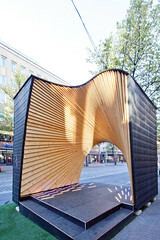 Tampere Architecture Week is an annual event about architecture and urban planning, intended to add interest and discussion about the built environment. 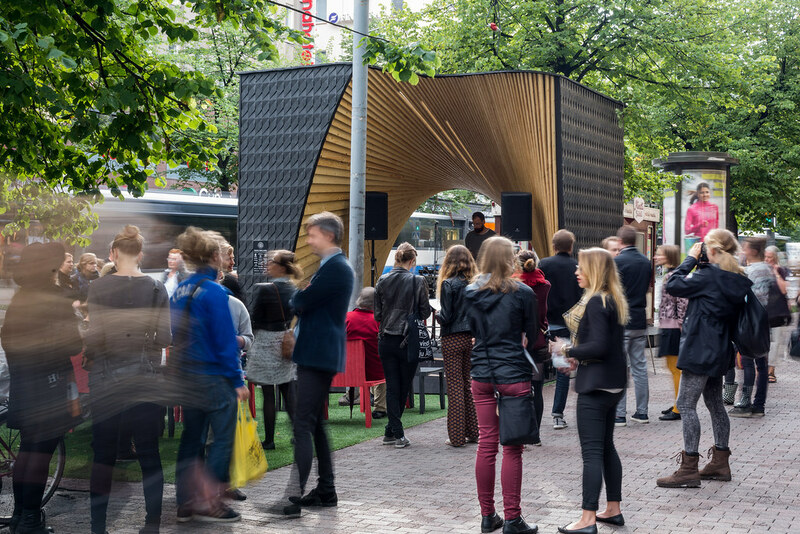 The theme in 2015 – interaction – aimed to increase the possibilities for interaction between citizens themselves and between architects and citizens. Functioning as an open stage for free expression and performance, Pauhu pavilion aims to highlight interaction as one of the most crucial subjects in our ever more privatised and secluded cities. The name “Pauhu” refers to the distant roar generated by the Tampere rapids, by the city around the pavilion, as well as by the artists and presenters the pavilion is hosting. 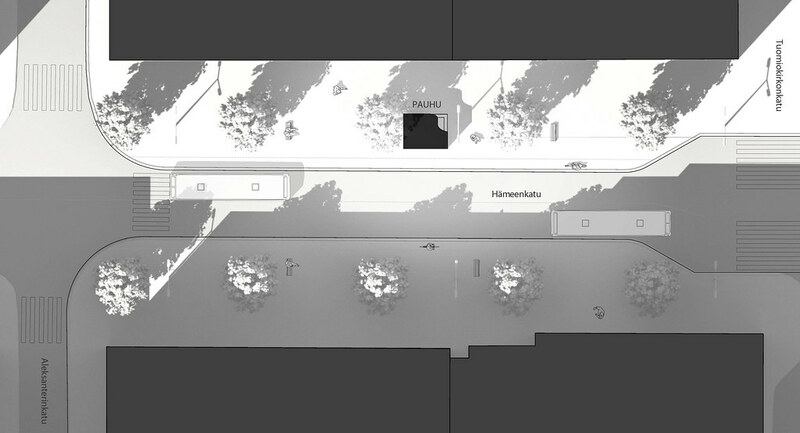 The interlace of public, private and communal interests was essential and absolutely crucial in making Pauhu possible. 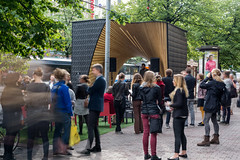 Along with its intended use as an active open-stage for public debates and performances Pauhu aims to promote forward looking thinking in architecture focusing on the innovative use of wood. 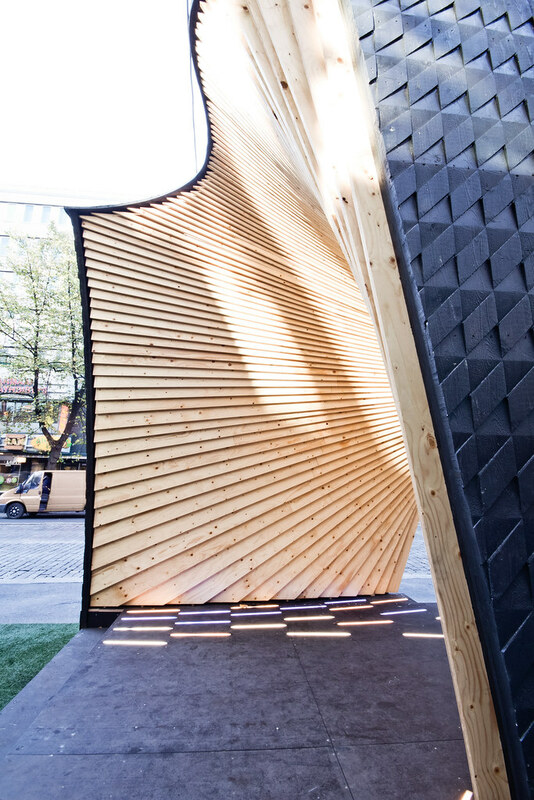 The construction process fuses conventional and tested building methods with state-of-art digital design and fabrication processes. 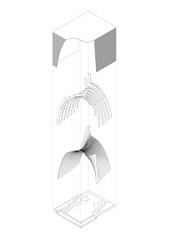 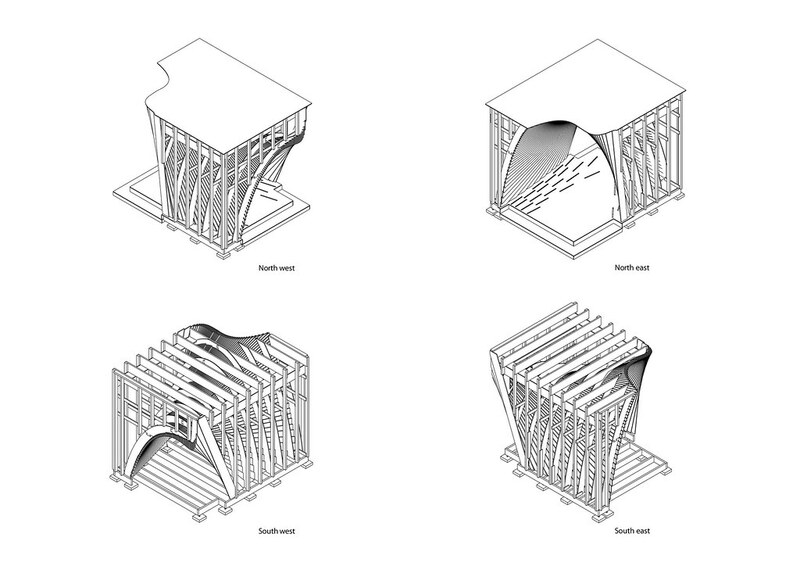 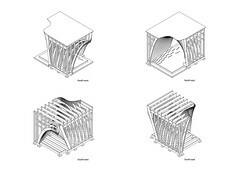 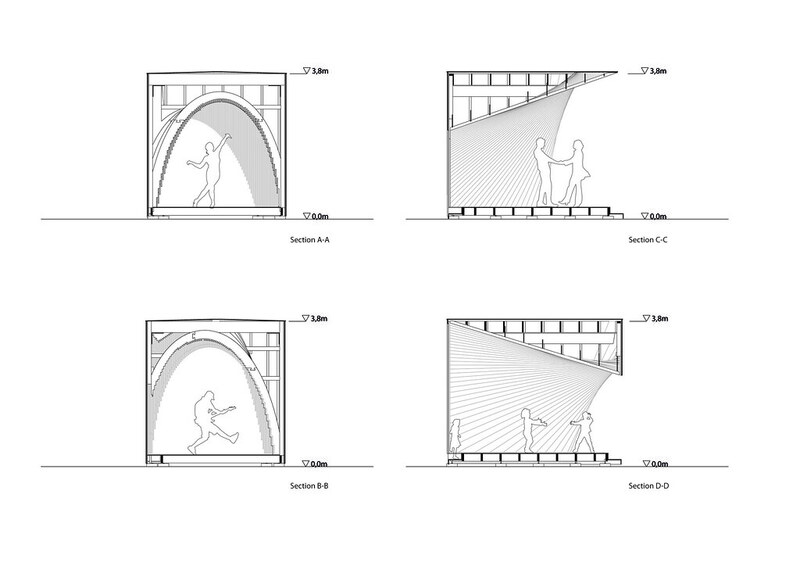 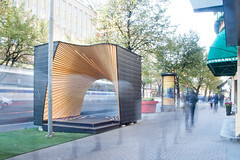 The pavilion was designed using algorithm-aided design methods as a detailed and accurate parametric 3D-model, from which all construction information and fabrication data was derived from. The inner smooth form of the pavilion is inspired by the flowing waves of the rapids, as well as the intricate plywood sculptures by the legendary Finnish sculptor Tapio Wirkkala. 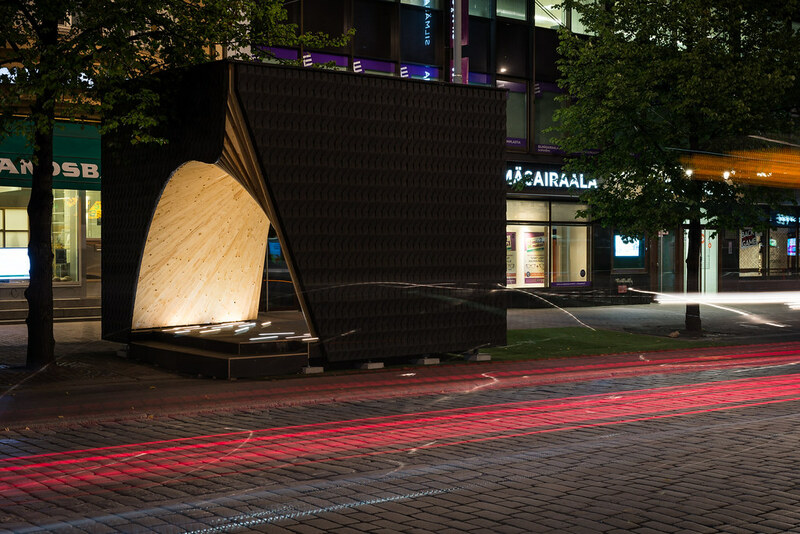 The smooth interior is seemingly carved out of a solid block of rough wood, which is emphasized by the contrasting colour tones. 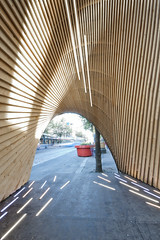 The interior is generated as a ruled surface by a rotation of plywood strips along the width of the pavilion, and while it appears to be doubly curved, the strips are all flat, un-bent and rectangular in shape. 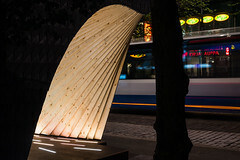 The plywood strips are connected to notches on an array of CNC-milled supporting arches. 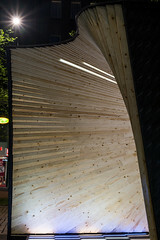 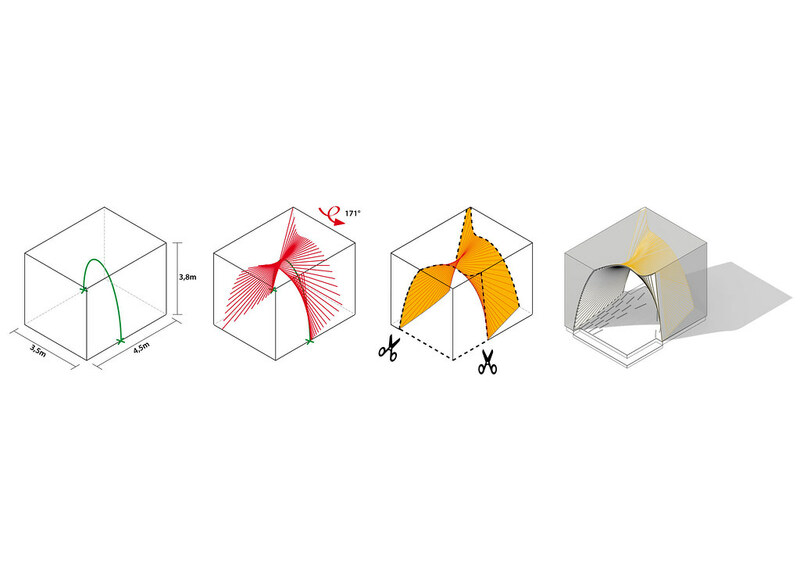 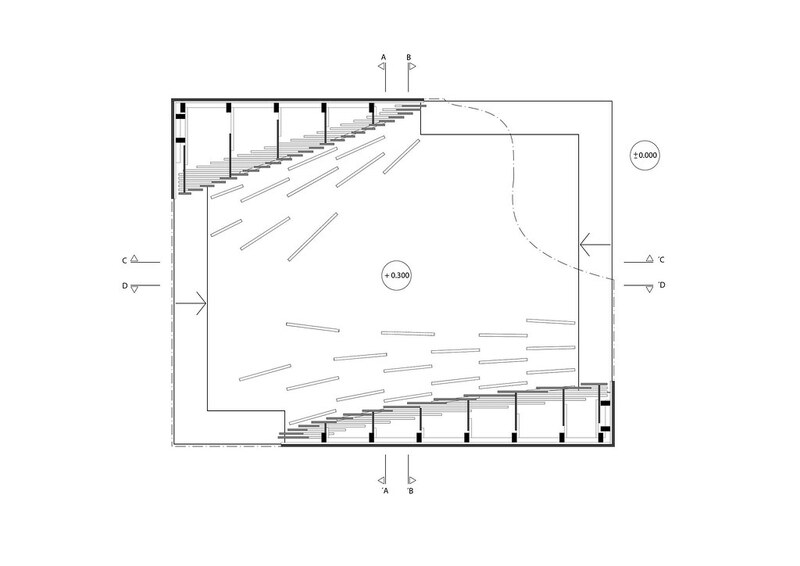 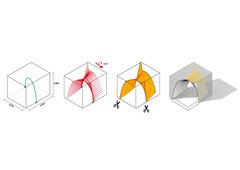 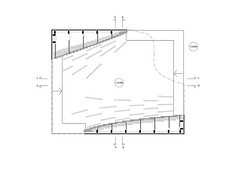 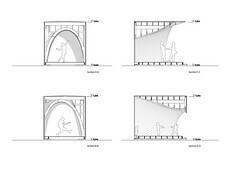 The heights of the individual strips vary according to their overlap, which allows for the optimization of material usage The resulting expressive shape forms an eye-catching frame and a backdrop for the presenter, while being a simple structural implementation using minimal amount of CNC-milling. 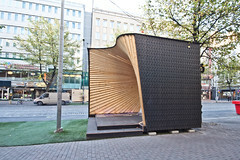 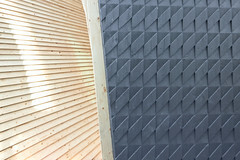 The outside of the pavilion is clad with a three-dimensional wood texture. 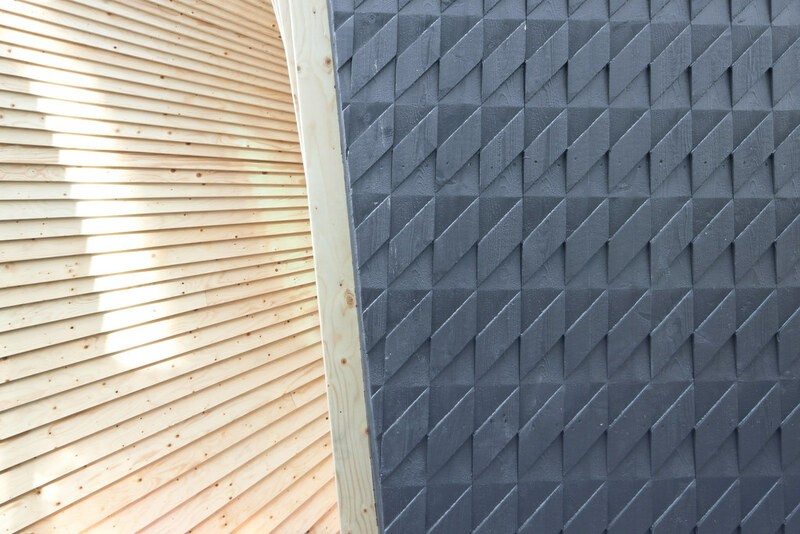 The structured panelling is a new product innovation by Jukola Industries, called Grafwood. 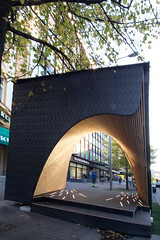 The texture invites passers-by to touch and feel the unusual material. 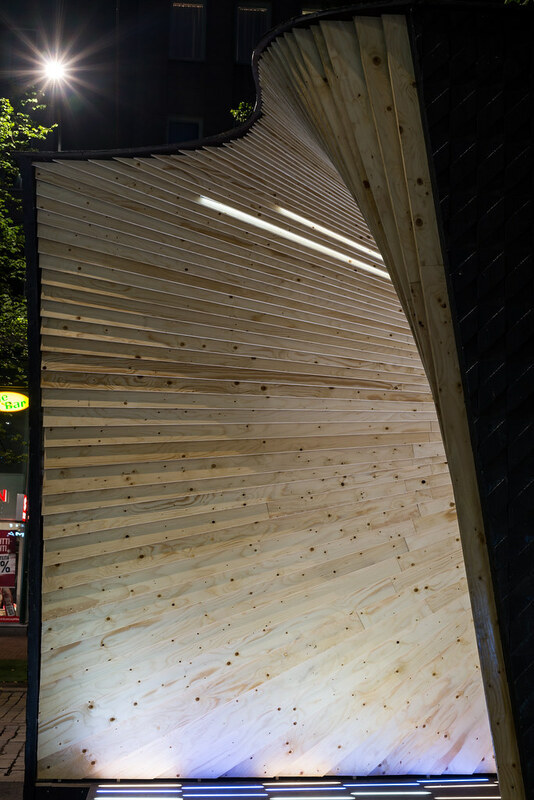 The appearance light and shadows on the dark façade lives with the rhythm of the day and weather conditions. 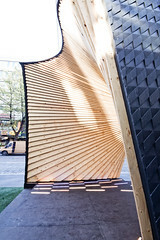 The construction of the pavilion took eight days from a group of architecture students, and it was built off-site and brought to location on a truck. 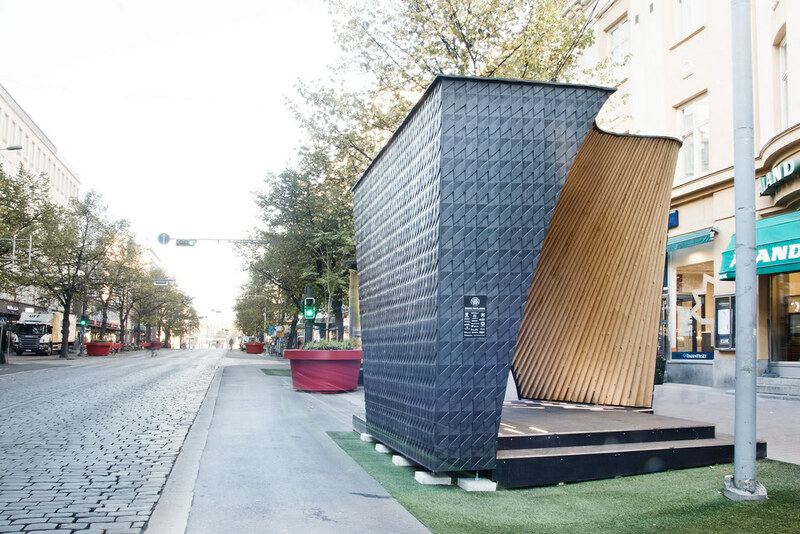 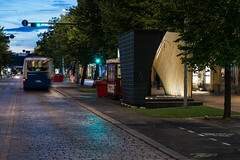 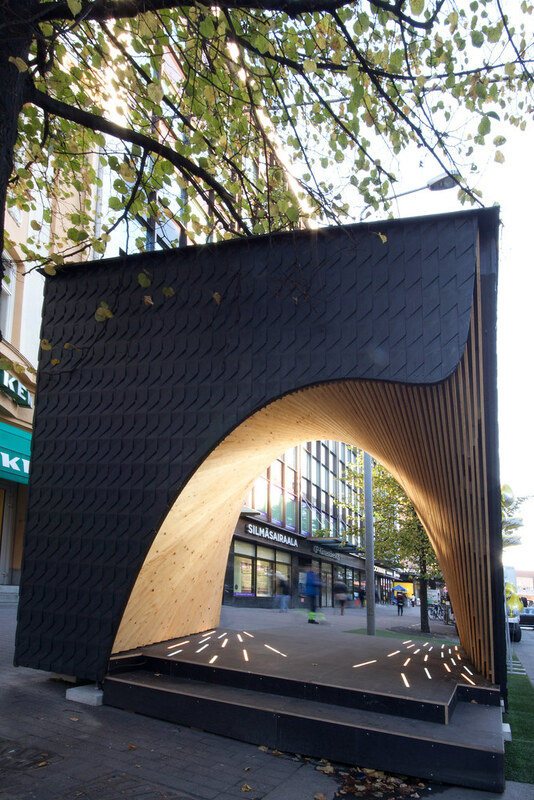 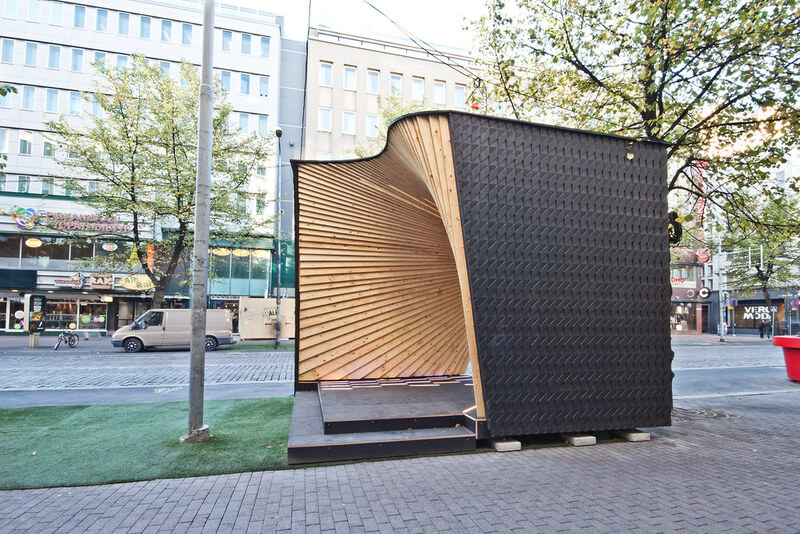 The pavilion is a temporary construction, scheduled to remain in its location until the end of 2016 as part of the city’s project to liven up one of the central streets of Tampere“.